Impress your better half on Valentine’s Day in Budapest with a fascinating and romantic river cruise along stunning city views of the UNESCO World Heritage. On February 14 there are three beautiful Valentine’s Day Dinner Cruises in Budapest with live background music, one with a la carte dinner and serving staff, one with a 4-course served dinner, and one with buffet style dinner. During the cruise the most stunning attractions will serve as the backdrop of your romantic cruise. Do not miss our Valentine’s Day Deal, book while you can, as tables are limited. Budapest is romantic all year round with its romantic sights and incredible views. And, luckily, February is no exception, even if the days are cold in Europe in Feb. There are many romantic things to do, regardless of the length of your Budapest stay, for short, 2 – 3 day or longer, one week holidays. The romantic Castle Quarter with the Buda Castle, the Fisherman’s Bastion, the Matthias Church, historic cafes with wonderful cakes, lovely concerts, great wines, romantic hotels make Budapest an ideal destination for couples. In February, Budapest is still cold, but it is a lot of fun: Hungarians celebrate the Carnival season with fancy dress parties (like the ones at Halloween in western countries). Also, many people enjoy the skating rinks all over the city, most importantly the huge Outdoor Skating Rink in Budapest City Park with the romantic Vajdahunyad Castle in the backdrop. 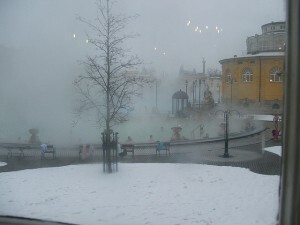 The outdoor steaming pools of Szechenyi Baths offer a unique way to let off steam on Valentine’s Day too, especially with couple’s massages, like the Harmony Massage in Szechenyi Bath. 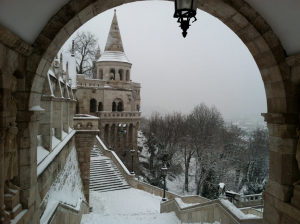 Budapest is a great place for luxury or modest, even budget Valentine’s Day breaks. From the five star Four Seasons Gresham Hotel (voted top 23 in the world by tourists), through design hotels like Hotel Zara (with its own spa) to lovely suites in cheap hotels in Budapest, you can find great romantic accommodation for your February romantic weekend getaway. 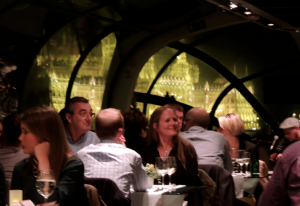 As for the Valentine’s Day Cruise, the winter‘s chill cannot be felt inside the heated ship, but it also means that you will have to bring a warm coat for the river cruise if you want to take a look around on top of the deck or on the terrace, in the fresh air. On some February days there is snowfall, which makes the city’s parks pretty. Valentine’s Day is celebrated by Hungarian couples with Valentine’s Day gifts of love (chocolates, roses, cards, etc. ), Valentine’s Day dinners, and of course Valentine’s Day romantic walks, movies, romantic breaks, etc.